CRISPR-Cas9 is a system for creating specific and accurate edits to the genome of a wide variety of target cell types. Depending on experimental design, genome editing with CRISPR-Cas9 has many applications, such as creating specific point mutations or mutation corrections, “knock-in” gene insertions, whole gene deletions, or short disruptive insertions or deletions (INDELs).1 It is important to assess genome-edited cells to verify that the alteration of interest occurred without inadvertently affecting off-target loci. This document provides an overview of commonly used methods to detect, verify, and quantify CRISPR-Cas9-mediated genome editing. Generally, a screening assay is first performed to detect the presence of a genetic alteration. This can be accomplished using a heterogeneous population of cells 48 - 72 hours after CRISPR-Cas9 ribonucleoprotein (RNP) delivery and/or clonal (isogenic) subcultures. Screening alone may be sufficient to select an effective guide RNA (or crRNA) in the first instance and, depending on the assay chosen, can be informative of the relative proportion of possible editing outcomes observed, i.e. heterozygous mutant (INDEL or single base edit), homozygous mutant, compound heterozygous mutant, or wild-type. However, when the edited cells are to be used in downstream assays, screening should be followed by a more detailed sequence assessment in positive populations or clones, both at the target locus and at potential off-target loci, to ultimately obtain a pure population of cells containing only the alteration of interest. This bulletin describes four strategies for screening edited cells based on mismatch cleavage, Sanger sequencing analysis, polymerase chain reaction (PCR) amplicon length, and restriction endonuclease pattern. While the mismatch cleavage assay and Sanger sequencing analysis can be used to screen for edits from most experimental designs, PCR or restriction endonuclease-based assays require that screening tools are incorporated into the project design. We also briefly describe ways to confirm on- and off-target effects at the sequence level. 1) Forward and reverse PCR primers are designed to flank the target CRISPR-Cas9 site in an offset manner, e.g. 200 and 800 base pairs (bp) on either side. 2) After CRISPR-Cas9 editing, genomic DNA is extracted from the cells. 3) The target region is amplified by PCR using the above primers. 4) PCR products are denatured and reannealed; DNA from edited cells may reanneal with DNA from non-edited (wild-type) cells to create a heteroduplex. 5) ArciTect™ T7 Endonuclease I will cleave single-strand DNA at heteroduplex structures > 2 bp. 6) Due to the offset nature of the primers, the resulting fragments will be of different lengths and can be resolved on an agarose gel. The relative amount of cut fragments detectable on the gel thereby gives an estimate of the mutation frequency within the cell population. The most commonly used system to screen for INDELs in a heterogeneous cell population is the mismatch cleavage assay. This assay utilizes a DNA endonuclease with single-strand cleavage activity specific to heteroduplex structures (Figure 1). To perform the mismatch cleavage assay, the target region is first amplified from genomic DNA by PCR using primers that are offset to the desired Cas9 cut site (e.g. targeting sequence 200 and 800 base pairs [bp] up- and downstream respectively). The PCR-generated amplicons are then denatured and reannealed randomly. Where present, INDEL-containing DNA will reanneal with wild-type DNA into heteroduplex (“mismatched”) structures, generating a singlestrand loop of non-complementarity. An endonuclease such as ArciTect™ T7 Endonuclease I is then added, which cleaves at the loop to generate two shorter DNA fragments. The fragments are resolved on an agarose gel and the relative proportion of uncut and cut fragments provides a semi-qualitative estimate of the genome editing frequency within the population. T7 Endonuclease I is commonly used in the mismatch cleavage assay. It is a single-strand-specific endonuclease derived from bacteriophage, with high sensitivity to mismatches of at least 2 base pairs. Since it requires heteroduplex DNA to be formed, homozygous mutations will not be detected in clonal cell lines unless the PCR reaction is spiked with wild-type DNA. Due to these caveats, the editing efficiency determined by this method is generally an underestimate. Overall, the mismatch cleavage assay is a useful tool to quickly screen for the presence of INDELs and provides relative editing frequency between experimental conditions. Sanger sequencing can provide a relatively quantitative estimate of editing efficiency in pooled cell populations. Primers flanking the target locus are used to amplify the region and those PCR products are submitted for sequencing. It is important to include a wildtype control, such as the parental cell line, for comparison. Once sequencing data is obtained, the readout can be visually inspected and/or editing efficiencies can be calculated. Recently, a number of open-source software programs were developed to analyze Sanger sequencing traces generated from edited cell populations, such as the Tracking of INDELs by Decomposition (TIDE), Tracking of Insertion, DEletions and Recombination events (TIDER), INDEL Detection Amplicon Analysis (IDAA), or Inference of CRISPR Editing (ICE).2-5 These tools use slightly different algorithms to compare PCR-amplified and Sanger-sequenced DNA from both edited and unedited (control) populations and provide a detailed analysis of CRISPR editing outcomes. PCR strategies can sometimes be used to detect positive editing events, particularly for large insertions or deletions. For example, if the experimental goal is to delete a large coding region, then PCR using primers located outside of the target region will generate a smaller amplicon in cells where the deletion has occurred. Similarly, if homology-directed repair (HDR) is used to “knock-in” a DNA sequence, then PCR will generate a larger amplicon in cells where the insertion has occurred. The above strategy is limited to experimental designs that generate large changes (> 50 bp) in DNA length at the target locus. Regardless of the preliminary tactic used to screen for editing events, researchers should sequence deeply across the target locus to confirm the desired mutation is present at the desired allele frequency in potential positive clones. Sanger sequencing represents the most accessible readout of the coding alteration and is a widely available service. As outlined above, primers flanking the target locus are used to amplify the region of interest and those PCR products are submitted for sequencing. In addition, sequencing can be used to ensure that clones with any potential off-target edits can be eliminated from further characterization. Primers designed around predicted off-target sites (i.e. those identified by guide RNA design programs)1 can be used to amplify samples for sequencing. Determining the nature of the changes introduced throughout the genome after genomic editing is a necessary step to ensure validity of the experiment prior to functional assays. Although it is cost-prohibitive, next-generation sequencing (NGS) can provide sequence data of customizable target regions or of the entire genome (whole genome sequencing; WGS). Targeted deep-sequencing can be used to accurately assess editing efficiencies in cell pools and/or to simultaneously validate clonogenicity and the absence of off-target mutations with high confidence.7,8 Unlike Sanger sequencing or targeted NGS, WGS does not require specific sequencing primers and pre-determined loci. A library prepared from the genomic sample is amplified, sequenced, and mapped to a reference genome for variant detection. Algorithms such as CRISPResso (http://crispresso.rocks)9 or CRISPR Genome Analyzer (CRISPR-GA; http://crispr-ga.net)10 can be used to analyze NGS data. The NGS method provides DNA sequences at the target locus, homologous loci, and all possible sites throughout the genome in a non-biased manner. The above assays describe ways to evaluate editing at the genomic level. Once positive clones are identified, functional studies comparing multiple edited and unedited clones can identify mechanistic roles for the gene products. Through rigorous assessment of on- and off-target sites, the researcher can confidently attribute phenotypic changes to the induced alteration. STEMCELL Technologies. (2018) Technical Bulletin: Design Considerations for the ArciTect™ CRISPR-Cas9 Genome Editing System (Document #27083). Brinkman EK et al. (2014) Easy quantitative assessment of genome editing by sequence trace decomposition. Nucleic Acids Res 42(22): e168. Brinkman EK et al. (2018) Easy quantification of template-directed CRISPR/Cas9 editing. Nucleic Acids Res 46(10): e58. Yang Z et al. (2015) Fast and sensitive detection of indels induced by precise gene targeting. Nucleic Acids Res 43(9): e59. Hsiau T et al. (2018) Inference of CRISPR edits from Sanger trace data. bioRxiv. DOI: 10.1101/251082. Hodgens C et al. (2017) indCAPS: A tool for designing screening primers for CRISPR/Cas9 mutagenesis events. PLoS One 12(11): e0188406. Bell C et al. (2014) A high-throughput screening strategy for detecting CRISPR-Cas9 induced mutations using next-generation sequencing. BMC Genomics 15: 1002. Sentmanat MF et al. (2018) A survey of validation strategies for CRISPR-Cas9 editing. Sci Rep 8(1): 888. Pinello L et al. (2016) Analyzing CRISPR genome-editing experiments with CRISPResso. Nat Biotechnol 34(7): 695–7. Güell M et al. 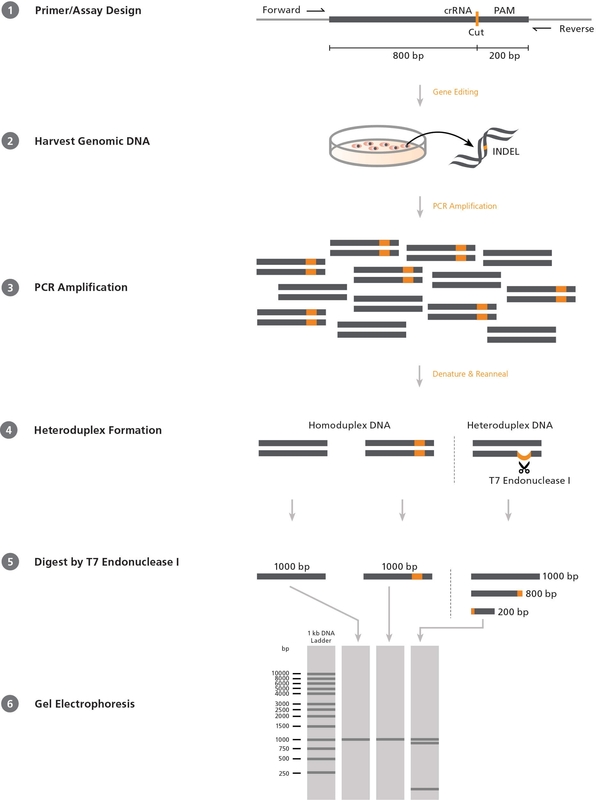 (2014) Genome editing assessment using CRISPR Genome Analyzer (CRISPR-GA). Bioinformatics 30(20): 2968–70.